Using the Tesla Model S P85 as his daily drive, Christian von Koenigsegg surprisingly does not own any Koenigsegg despite being the boss of the company. In an interview with Road and Track, von Koenigsegg revealed that he also has a Model 3 on the way while his wife gets around in a Volvo XC90 and a Porsche 911 Targa. 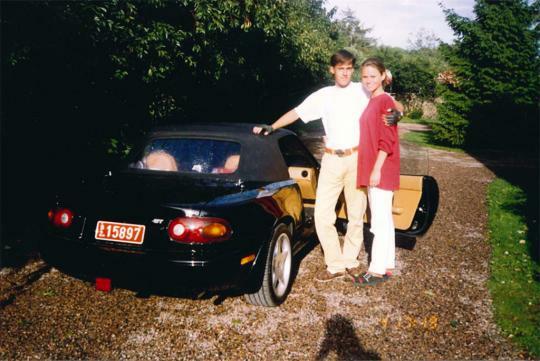 And eight months ago, they managed to add another car to their collection, a 1992 NA Mazda MX-5. This is no ordinary car as it was the exact same car von Koenigsegg owned around the time his company was founded a quarter of a century ago. “My first MX-5 has been back in my hands for about eight months,” he told the publication. “Our transport manager went to a car show on a Swedish island called Öland, and there was this black Mazda MX-5 that said it ‘used to be Christian von Koenigsegg’s car.’ So, he called me up and I spoke to the owner. “I overpaid a little bit to get it back, but now I can enjoy it on warm summer days! It’s in great condition, and it’s actually as enjoyable as I remembered to drive!” von Koenigsegg said.